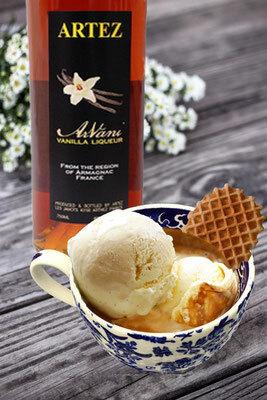 This week's "cocktail" is a celebration of this turning of the seasons, a vanilla ice cream sundae which harkens back to summer while incorporating the warm autumnal vanilla of Artez Arvani vanilla liqueur. Affogato is an Italian term for a scoop of gelato topped with espresso, but we see no reason you can't replace the coffee with Arvani for a decadent and slightly boozy after dinner dessert-and-digestif-in-one. Scoop ice cream into a tall, chilled glass or a shallow bowl. Pour Arvani over the ice cream. Garnish with pizzelle or vanilla wafer. * Belgian-style butter waffle cookies work well, as do Italian pizzelle or even classic Nilla wafers.